Wireless, waterproof data loggers with network interfaces for automated, error-free data uploading to TandD's free WebStorage Service, or Bluetooth models for direct uploading to your iOS or Android Smart Device with free Apps. Four channel graphing models available for voltage and temperature. 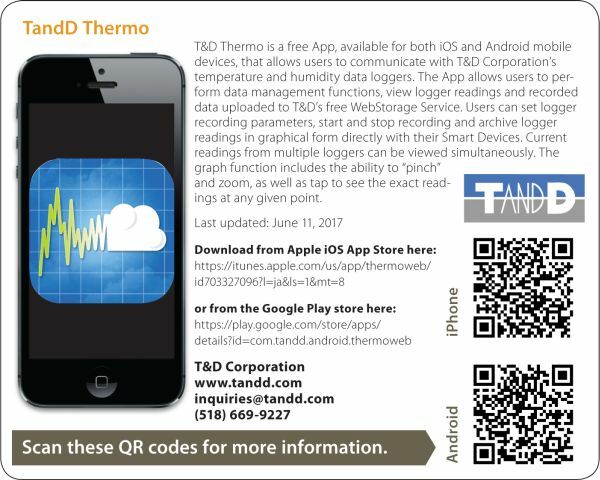 Description: T&D Thermo is a free App, available for both iOS and Android mobile devices, that allows users to communicate with T&D Corporation’s temperature and humidity data loggers. The App allows users to perform data management functions, view logger readings and recorded data uploaded to T&D’s free WebStorage Service. Users can set logger recording parameters, start and stop recording and archive logger readings in graphical form directly with their Smart Devices. Current readings from multiple loggers can be viewed simultaneously. The graph function includes the ability to “pinch” and zoom, as well as tap to see the exact readings at any given point.